Investors get greedy ... too greedy? Is the Fed really that powerful? 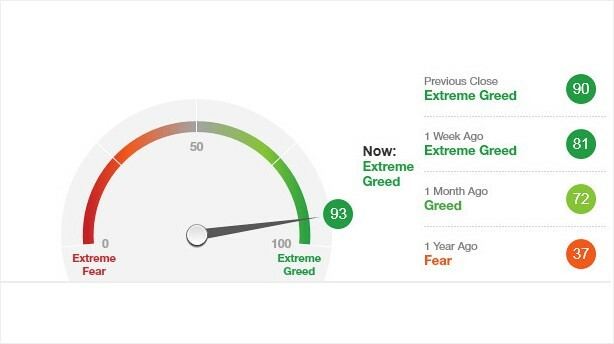 One look at CNNMoney's Fear & Greed Index says yes. Early Friday, the index surged to 94! That's a record high for the index, with data available since 2004. The index has been in 'extreme greed 'territory for the past week, as investors have been betting that central bankers around the world would do something to inject life into the sluggish global economy. And boy have investors been rewarded. Related: What is the Fear & Greed index? Last week, European Central Bank president Mario Draghi said the central bank was prepared to buy bonds in the secondary market to help preserve the euro and stave off a deepening crisis in Spain and Italy. The result? Borrowing costs in both of those sovereign nations pulled back sharply, with 10-year yields falling to their lowest levels in months. If that wasn't enough to whet investors' appetites, Thursday's announcement by the Federal Reserve that it planned to buy $40 billion of mortgage-backed securities (indefinitely) to boost the U.S. economy sent investors on a stock buying binge. While investors are cheering the moves, what's the economy showing? The latest inflation numbers rose sharply in August, with gasoline prices showing the biggest jump. While most aren't worried about rampant inflation, it could start to make consumers nervous. The Michigan sentiment index rose to 79.2 in early September -- much stronger than expected. That would suggest consumers (and investors) are willing to step out of the shadows. Or does it? Consumer confidence tumbled in August, largely over worries about the job market. And those worries have merit. The August jobs report was dismal, showing a sharp slowdown in hiring, while the unemployment rate ticked higher. So while the euphoria is all fine and good for now, we may actually be setting ourselves up for a hard fall. Consumer sentiment is sitting right around where it was before the last recession started in late 2007. And the Dow Jones industrial average is just 4% shy of its October 2007 high. So investors may want to proceed with caution. When CNNMoney launched the Fear & Greed Index in May, stocks were coming off one of their best quarters in years. We targeted 7 key market indicators, including volatility, junk bond demand and the number of stocks hitting highs and lows. Six out of the seven indicators are firmly in 'extreme greed', with the exception of market volatility, which tracks the market's other fear gauge, the VIX (VIX), and its 50-day moving average. We combined the 7 indicators into one index that tracks just how much risk investors are willing to stomach, on a scale of 0-100. With little room left for the Fear & Greed Index to rise, greed could soon give way to fear if the economy doesn't show more signs of life. After all, the Fear & Greed Index was in the single digits as recently as June on worries about the Europe debt crisis. If recent market history has shown us anything, it's that it doesn't take much to spook investors.